Wednesday night I took a trip to NYC to see my friend Reena and enjoy chocolate and wine. 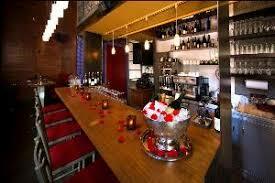 What else is there that needs to be said about a place about 400 square feet with chocolate and wine? 11 West 31st Street, between Broadway and 5th, so you know where it is. The place boast the ability to feel both tiny and give me the ability to enjoy my personal space, an issue with many small restaurants. The table isn’t large enough for the both the food and wine menus but that’s fine because the neurotic server will rearrange the items on the table until there’s room for every bit of food and drink you order. I believe we ordered a cabernet sauvignon but i can’t be too positive, We pointed and had the first thing that Reena’s finger landed on. I don’t drink wine properly. I believe that the method in which you sample your wine when you first get it does the wine minimum justice. There is a flavor a freshly opened bottle of wine has only twice. When you open it and when you’re at the end of it. And though not always good, it is honest, true, real. But to me, “Sour, sweet, bitter, pungent, all must be tasted.” Strong dry blackcurrant, though maybe a zante currant would add a bit of sweetness that it could have used. Once the wine opened, it changed to what is so still a bit dry but so much better a wine. I enjoy that transformation, that maturing of the wine in front of me. Then you open the dinner menu. We kept it simple to a selection of appetizers. Steak Tartare, Angry Chicken and some shrimp dumpling. I wish I could remember better, but that wasn’t much of the appeal. The food was good, overly laden with noodles and seaweed. Good, but almost unnecessary. Lets talk about Angry Chicken. Get it. It’s good and cute. I guess the angry is the mild amount of spice. 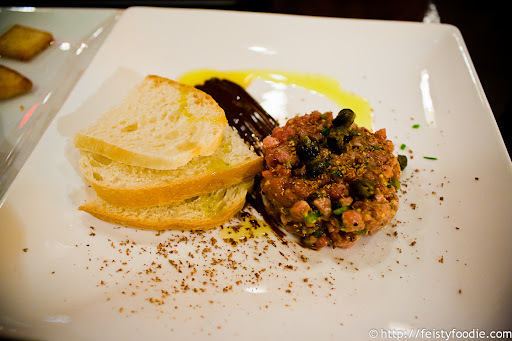 The Steak Tartare was all a good man can ask for in steak… still mooing and with horseradish. The chocolate, and the wine. Chocolate Choices we made, Bin 27 Port, Grand Cru and Alizé Hearts of Passion. Starting with the Bin 27 Port was enjoyable. The best of the portuguese wine hits you late, subtle and perfectly toned with the dark chocolate. The Grand Cru was a bit of a wash. The flavours dissipated while eating, leaving you with just a dark chocolate in your mouth. But the recovery was the alizé hearts of passion. For those like me who enjoy the bold taste of pure passion fruit, this truffle offers that. Do not pair with red wine or a dry wine. If you’ve ordered a red or dry wine, just eat this truffle by itself. It presents a richness and boldness that makes even the most dull tongue understand why chocolate affects emotions. All in all, Ayza is a good find and I recommend to anyone wanting to have a good day out. Don’t go hungry, but the prices aren’t bad. Enjoyable, fun, friendly and the architectural details are fun. You’ll love when you figure out where the wine comes from.